A great read for anyone who has ever wondered about the functions of all those cables, wires, and electric doohickeys that litter our roadside landscape. What's that? You mean I'm the only one? OK, fair enough. Well, have you ever pondered how crude oil is drilled, refined, and shipped to gas stations? No? I can't be the only one. Come on, people, work with me. Seriously, this book is really interesting. Maybe I should get out more. What is this stuff? You see it out there, stewing in rust or aspirating flame into the firmament and you think to yourself, "I can barely build a deck for the back yard. I can't even identify that thing. Do people actually work there?" Finally, we have a field guide that answers these important questions. Definitely a techie delight. Ever wonder what all those things on a utility pole are for? What all those towers and pipes in a refinery are? Why a wind turbine looks the way it does? Many pictures, and good explanations, in depth but not too much so. I wish it was an app though, it's a big book and definitely not a field guide. It has just been updated, esp to include more communications and Internet stuff, the review in the WSJ was positive. I wish I had this book when I was a kid.. I have fond memories of watching episodes of Mr. Rogers when I was a kid and seeing the inner workings of things like crayon factories, one of my favorite elementary school field trips was to a local power plant, and my parents learned early on that one way to get me to stop tormenting my brother was to hand me picture books on construction equipment. If you're the kind of person who's interested in machinery, factories, power plants, and all the other aspects of the modern industrial substructure that are often hidden behind the commercial and residential façades of everyday life, then this is the book for you. Hayes went on countless trips over the course of a dozen years to photograph and describe places like strip mines, power plants, cement plants, water purification facilities, bridges, railroads, airports, shipping terminals, and much more, with an eye towards showing exactly what it takes to discover, extract, transport, refine, assemble, and deliver all the things that allow our societies to function. His basic philosophy on this stuff is summed up well in his Introduction, after a brief discussion of both the nature-is-best-unspoiled maximalist environmentalist and the Earth-is-our-dominion pro-development positions:"My chief aim is simply to describe and explain the technological fabric of society, not to judge whether it is good or bad, beautiful or ugly. And yet I would not argue that technology is neutral or value-free. Quite the contrary: I submit that the signs of human presence are the only elements of the landscape that have any moral or aesthetic significance at all. In nature undisturbed, a desert is not better or worse than a forest or a glacier; there is simply no scale on which to rank such things unless it is a human scale of utility or beauty. Only when people intervene in nature is there any question of right or wrong, better or worse. When we look on a pristine glade, we are mere bystanders, but when we walk down a city street, we are responsible for what we see (and what we hear and small), and we are therefore called on to pass judgment. "For a much more thorough (and lyrical) discussion of questions about the morality of development and the inherent value, if any, of nature in its raw state, please see John McPhee's superb Encounters With the Archdruid. Meanwhile, this work begins with an exploration of the mining industry and doesn't stop probing the plumbing of the world for 500 pages. Hayes describes not only the names of important concepts (e.g. the difference between open-pit and open-cast mines), but how they fit in the industrial ecosystem, as well as important other elements such as the chemistry behind a particular process in a friendly yet rigorous way. For example, here he's talking about steel mills:"The heated air is delivered through a fat duct that encircles the furnace about 20 feet above the base. This encircling duct is called a bustle, a name that has lost some of its descriptive power with changes in women's fashion. The pressurized hot air rises through the mix of ore and coke and limestone, igniting the coke and thereby raising the temperature even further.Roughly speaking, the recipe for making iron is three cups of taconite to one cup of coke and half a cup of limestone. The chemistry that goes on when these ingredients are brought together is different from what happens in the smelting of copper. As described earlier, a copper smelter uses oxygen to lure sulfur away from the metal. But that can't work in the case of iron because the iron is already bound to oxygen. The oxygen is what needs to be removed, and it is carbon that acts as the seducer, carrying oxygen away in the form of gaseous carbon monoxide. Meanwhile, the limestone, the third ingredient, combines with other impurities to form a slag. "I also appreciate that he mentions political controversies, beyond the aforementioned basic environmentalist/developer one. A strip mine might be an impressive technological accomplishment, but it's also one of the worst things human beings can do to the planet. Hayes does not shy away from presenting the downsides to the upsides, or showing how things like levees both protect farmland and also engender perverse incentives to blow up your neighbor's levee to protect your own during a flood. He also occasionally dips into the more colorful sides of history; I wish there had been more info than he gave on exactly how this or that technological innovation progressed or came to be, but I appreciate that the book is already fairly long, plus he included a helpful list of further reading. Basically, Hayes nerds out blissfully about stuff like the evolution of the design of municipal water towers for the entire time, until he gracefully closes with an insightful Eloi-and-Morlock-ish analysis of how people relate, in our current era of automation, the "knowledge economy", and deindustrialization, to the "post-industrial" landscape of shuttered refineries, empty factories, and roboticized production lines:"There is something of a paradox here. On the one hand, people today deal with machines on a much more frequent and intimate basis than earlier generations did. We pump our own gas; we get our cash from the ATM instead of a bank teller; we check our own groceries at the supermarket and our own books at the library; we make our own airline reservations over the Internet instead of consulting a travel agent. But most of us know less and less about how all these machines work. We know how to use them, but not how to build or fix them. As for the more remote machinery - the turbines, pumps, generators, transformers, switches, amplifiers, transmitters, and all the rest of the apparatus that keeps an industrial economy humming - all that is quite out of sight.... There is something sad about a society in which large numbers of people don't understand the substrate of their own world. In the case of the natural world, everyone ought to have at least a rudimentary grasp of the laws of physics and those of biology, such as Darwin's principle of evolution by natural selection. Without a sense of how materials and energy flow through an industrial economy, you miss something basic about the world you live in.... Sooner or later, decisions about the direction of important technologies have to be made by a democratic process. People who have never seen a power plant, who know nothing of how it works, who have never met anyone who works there, are poorly equipped to judge the relative merits of nuclear and coal-fired technologies, or to seek alternatives that might allow us to dispense with both. To make good decisions about such issues, citizens need to get better acquainted with the technological underpinnings of their own communities. "It's hard to argue with that, and it would be hard to find a more beginner-friendly way to get acquainted than this well-written, enthusiastic, and informative guide. I love to read about the mundane, grubby stuff that makes modern life possible--railroads, electrical power systems, communications networks, even water and sewer systems. This book covers them all. It's a marvelous one-volume overview of how modern infrastructure works. It's a great book for skipping around in. Just pick a section on your favorite gnarly bit of infrastructure, and prepare to be educated. It's also an excellent reference work. Few books have changed the way I look at the world as much as this book did. Utility poles suddenly became interesting. The ultimate guide book for the physical manifestation of modern civilization. Even if you hate the topic you should read this book. SO GOOD. This book taught me more about the world than any college class ever did. The world will never be the same... my commute, a trip to the airport, a road trip, turning on a light, pouring a glass of water, using my cell phone - an extra dimension has been unlocked.I found myself unable to put this book down, which is not what I was expecting from a textbook-type format. Hayes's writing is imaginative, full of wonder, and hilarious. Certain passages are poetic, like his description of walking through a wind farm one afternoon. In short, I find the author's way of thinking, writing, and overall attitude to be exemplary.DISCLAIMER: I am an engineer and like mechanical stuff. Fantastically broad spotters guide to modern interventions in the landscape, and overview of the design and engineering choices that have led to certain forms and systems appearing throughout (mostly American, but not exclusively). Most interesting and pervasive are the full-system tours of mining/refining/agriculture, power generation, and water / waste infrastructure, focusing on the components you can recognize from everyday travels. I found this book to be an exhaustive (and exhausting) compendium of things industrial. It focuses on the visible infrastructure of industry--pit mines, smokestacks, water towers, dams, power transmission lines--and explains what you are seeing in the landscape, and the overall process that necessitates the feature. If you've ever traveled cross country (particularly I-40 in the Southwest) and wondered about the random industrial things you've seen along the road, this guide can help decode the mystery. I enjoyed learning a lot more about various mining practices and refinement of ores as well as other topics It was hard not being overwhelmed by the sheer scope of the book (probably a factor of not having much time to read it). Sometimes I wished there were more pictures or diagrams of processes described in the text. It's a pretty massive book--wide rectangular pages, thick paper to accomodate the color photos. And the hardback library copy I was reading showed some serious spine damage. I would imagine the paperback version would suffer even worse. What are the conical structure atop flour mills and lumbermills? Why are there 3 wires running along most electric power poles? Why are TV towers red and white? Why are the blades of a windmill in the front? Hayes answers these type of questinos in this interesting book. He apparently spent about 10 years taking photos of industrial sites around the world. Here he explains what they are and why they work. His writing is also thoughtful, beginning with mining and ending with waste management, where the end products are returned to the earth. Infrastructure is a field manual and background text on all of the infrastructure that define our modern industrial landscape. Hayes has an eye for pointing out the significance of otherwise overlooked parts of what we see every day, and weaves together a cohesive picture of our processes. What a cool book! It reminds me of those David Macaulay books I loved exploring as a kid, but this is definitely for adults. It's not difficult to understand, but the author doesn't shy away from getting into explanations of engineering concepts and also some of the basic physics and chemistry behind energy inputs and transmission. The field guide style photos and captions are the highlight, but his writing is clear and interesting.Of course, some things I wanted to read about (construction equipment! subways!) were missing, but this is already a good 500-some pages on hefty photo-quality paper, so the line has to be drawn somewhere. What's there is very fun and answers questions I didn't know I had. This is an on-again, off-again really entertaining look at the way we live in the world. It's not detailed engineering, but instead is a quick sense of how things get from one place to another -- oil to cars, coal to electric outlets, water to farms. Full of interesting stuff, and moving rapidly. Makes the car drives way more interesting -- you can go "Hey, I know what that is now!" Read a chapter, put it down for a while, read another one, enjoy the whole thing. It's exactly what it says it is in the title. All those structures you see off the side of the road - you will now know what they are and how they work. The author writes with a certain awe of what man hath wrought, and it's kind of unusual. He's aware enough, however, to note when his topics aren't environmentally friendly. If you ever wondered what we do to make industrialized civilization possible, this is a good book to read. Ample pictures and text explain the technology that makes our lives possible, from mining to manufacturing, distribution, power, transportation, agriculture, power, communications, and much more. Too much coffee table book here, I'm afraid. I'd rather have something that focuses more on showing me the things I might see and helping me identify them than something with as much text as there is here. What a fascinating book! Read and find out what all of those giant purposeful-looking industrial buildings-n-stuff are for. My wife is excited that I'm done with this book because I couldn't stop talking about all of the neat things I learned. Strictly for techno nerds, if looking at photos of industrial equipment isn't your thing, you won't like this. On the other hand, if you drive by things and wonder "What's that?" it's a nice introduction and coffee table book. Very clearly written. I wish it was actually sized as a field guide, though. The pictures are fantastic in large format, but it sure would be handy to have in the glove box for sorties up the Jersey Turnpike. 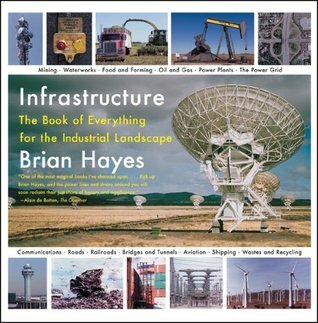 If you've ever wondered about all that industrial infrastructure you see around you driving down the road, this book explains it all. What can I say. I like a wide variety of books on a vast array of subjects. This has lots of pictures and fascinating insets. Nice pictures, was amazed by the scale of mining machines. A more global perspective would have been nicer. Clearly explains and illustrates the systems and forces that shape the real functionalism of industrial infrastructure. Awesome for road trips.